Geopolitical tensions have lit a fire under gold and silver prices. A confluence of factors has finally pushed gold and silver above key technical resistance levels. Gold hit a 5-month high, rising over $20 (1.5%) to $1,275. It is the highest print for gold since the election of Trump. Silver also rocketed higher, climbing more than 40 cents (2.2%) to $18.35. But it was not just the magnitude of the move higher that is important. 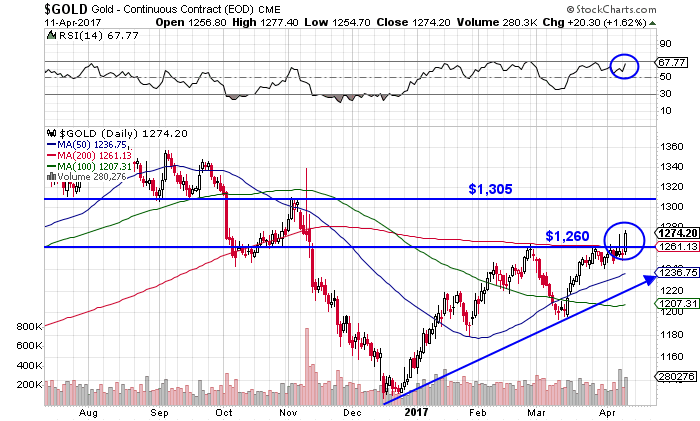 Gold finally broke through the $1,260 price level, which was previous resistance and the 200-day moving average, to make a new 2017 high. We would like to see at least one more day of gold holding above this price level, but the implications of this move are significant. The RSI momentum indicator is also pointed higher with room to run before becoming overbought. 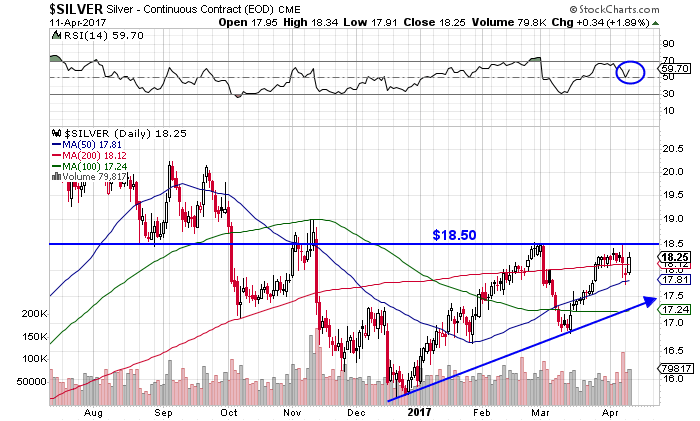 Silver spiked back above the 200-day moving average on Tuesday, but has yet to make a new 2017 high. We would like to see silver close for two consecutive days above $18.50 in order to confirm gold’s move higher. The RSI for silver is also pointed higher with plenty of room to run before turning overbought. Mining stocks, as tracked by the Gold Miners ETF (GDX), also performed well today. They offered leverage to the move in precious metals, advancing by 3% today or nearly double the move in gold. While this is bullish to see, the GDX still has some work to do in order to eclipse its 2017 high of $25.71. While those with a high risk tolerance can increase exposure immediately, we ideally want to see the GDX confirm the move by establishing a new 2017 high in the days ahead. Investors are seeking refuge in safe-haven assets due to rising tensions over U.S. relations with Russia and North Korea. While there are signs that the U.S. is not going to increase its involvement in Syria beyond the occasional missile strike, the stakes remain very high as the nuclear-armed Russian military is operating in Syria. Should one of those Tomahawk missiles strike the Russians, the situation could go critical. Russia and Syria have gone as far as stating that they will retaliate if there is another attack by the United States. Meanwhile, the U.S. Navy has re-directed a powerful armada of warships towards North Korea. China is likely not pleased with this development, which may help to explain why they are suddenly motivated to pressure North Korea. China has deployed 150K troops to the border in order to deal with the possible North Korean refugees over fears that Trump may strike Kim Jong-un following the missile attack on Syria. Korea has the capability of hitting American bases in South Korea and Japan. They claim to be able to deliver nuclear weapons to the West Coast of the United States, but opinion differ on whether or not this could be true. “As you know, an important part of my project is to regain our sovereignty and thus free ourselves from the anti-democratic rules of the European Union.I give you six months of negotiation, at the end of which you will decide, by referendum, whether we belong to the European Union or not. Another factor increasing demand for gold is the sudden weakness in global stock markets. The major U.S. stock indices declined in March for the first time in nearly a year and have continued sliding into April. The NASDAQ was down more than 1% this morning, before recovering the bulk of those losses into the close of trading. It is also worth pointing out that the Atlanta FED has slashed their Q1 GDP estimate to just 0.6%, from initial readings as high as 3.5%. Furthermore, the CNN Fear/Greed index has plummeted to 31 (Fear) after spending most of the past year in the “Greed” section. These events may be the spark that precious metals needed to finally start moving higher again. After six weeks of correction and consolidation, I believe that gold and silver have plenty of pent up energy waiting to propel prices significantly higher. If the massive paper short positions on the COMEX are forced to cover, this will add fuel to the fire. Mining stocks are very undervalued at the current time, having corrected sharply in March. We believe the rebound in mining stocks in the near term and subsequent move higher over the next 12 to 24 months is going to generate significant wealth for those positioned ahead of the curve. A move back above $1,500 gold and $20 silver will send profit margins soaring for many of the top miners. One junior gold miner that we have highlighted for subscribers is up over 60% in the past week. They have been hitting multiple high-grade intercepts, Eric Sprott recently increased his investment and their property borders one of the most promising Canadian gold projects. Our top silver stock pick was up 8.5% today alone and a PGM miner that pays a hefty dividend has generated returns of 31% for us in the past month. Lastly, our top cannabis stock has generated return of over 400% for subscribers in the past year and has doubled in just the past six months. All of the stocks mentioned above are detailed in The GSB Contrarian Report, our top-rated newsletter. Click the button below for instant access to the newsletter, model portfolio and ongoing trade alerts whenever we are buying or selling. We believe the newsletter will pay for itself many times over, so it is best viewed as an investment, not an expense. 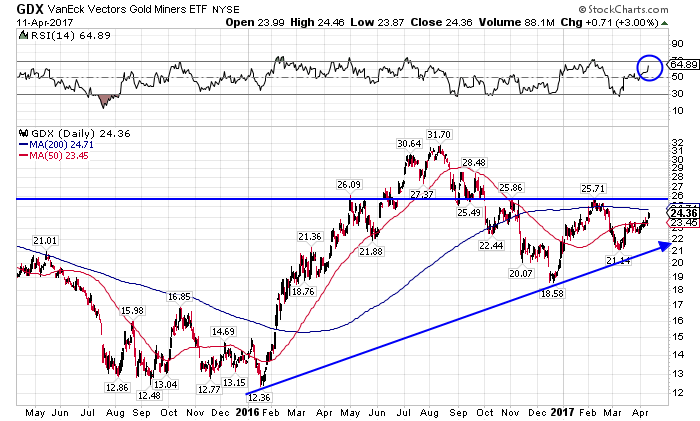 Precious metals are breaking out and the buying opportunity is not likely to last much longer. Start profiting with us now by clicking below!